Thanks for the questions Renee. The rug is the Chandelier Ink from Dash & Albert. Those sconces are great for the space. Can you tell me what they are called and where they are from? Thanks so much! Hello Anne! Thank you for the question. The sconces are the Arc Sconce and they are from Pottery Barn. They’re a great plug-in sconce option for a space such as this where you cannot hardwire the fixture. Hey again. Thanks for the response on the walls! Where did the curtain rod come from or what brand is it? This room is amazing by the way! I’m in love with this headboard! Could you please give me the dimensions? Thanks for the nice words about the headboard. It’s my favorite element as well in this space! This piece was custom made for the client and measures 66″ wide at the base and 72″ wide at the molding. It is 84″ high. Thanks for the inquiry! Adore this room. Where did the quilt come from? So glad you love this room! And thanks for the inquiry. The duvet cover is and ivory matelasse and came from Pottery Barn. I see that you had also asked about the shams. 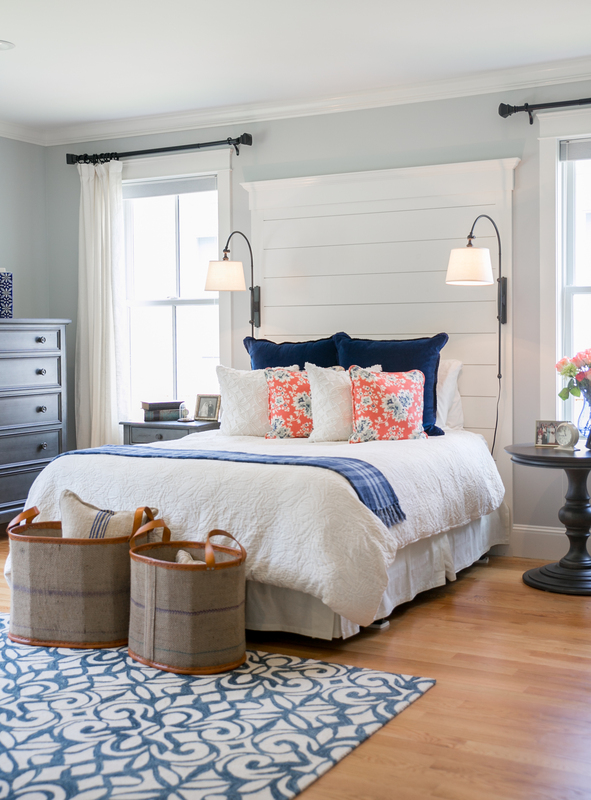 They are from several sources – the navy are from a local store, the cream pillows are from Pine Cone Hill and the navy and coral pillows were custom made. Please email me if you would like any additional assitance sourcing anything. I have been looking everywhere for the blue plaid throw. Can you tell me where it is from and if the bed is a queen or a king. Thank you! Hi, LOVE this room. I’m renovating my house and plan on using this room as my inspiration. Can you tell me what color gray the furniture is painted? Hello Dona-Jean. I’m so glad you love the room. It’s one of my favorie projects. The furniture is from Ethan Allen and is the Sharkfin finish. Thanks for the inquiry and good luck with your project!